The BGAN system started out to provide the land based equivalent of the traditional maritime satellite terminal, but without complex automatic tracking system and radome as used on ships at sea. The land device, called BGAN has a low gain antenna and requires only approximate pointing. It provides bit rates of up to 432 kbit/s up and down. The smaller models achieve lower bit rates like 216 kbps down and 72 kbps up. Note these are shared bit rates, not average. You pay a lot per Mbyte so it is not to be regarded as broadband access. The BGAN air interface specification was optimised for a land-portable operation such as putting the terminal on a table outdoors. It provides email and satellite internet access direct to laptop sized portable terminals. Inmarsat, who are running the plain BGAN project, have selected Xantic as one of its suppliers for the interconnection between the terrestrial network carriers and the mobile satellite terminals users for its voice interconnect services networks. Voice is possible but demanding. The low gain antennas need a lot of power from the satellite. BGAN service start in 2006 and offered circuit and IP packet switched data services as well as voice services using the Inmarsat 4 series satellites. Three identical INMARSAT 4 satellites are used, spaced around the equator in geostationary orbit. 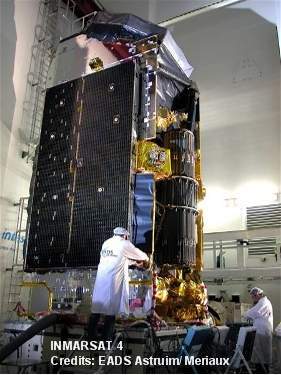 The first INMARSAT 4 satellite, made by EADS Astrium was launced in 2006 to orbit location 65 deg East. The satellites use ion beam engines for station keeping propulsion. Other characteristics: 45m long solar array 14kW BOL power. 5940kg BOL mass. Antenna diameter 10m, with 200 spot beams with variable power and bandwidth to each beam. The feed system would appear to be about 4.2m diameter. If you take the earth as a 17 deg diameter circle see how to fit in 200 spot beams, work out the diameter of each beam derive the tx and rx gain and G/T. then try some link budgets.